A fine fiber blend, used to thicken resin to create a multi-purpose adhesive, excellent for bonding wood. When used it provides good gap-filling qualities white retaining excellent wetting/penatrating capabilities. Off white in color. A thickening additive developed for maximun physical properties in hardware bonding in which high-cyclic loads are expected. Can also be used for filleting and gap-filling where maximun strength in required. A strong wood-toned filler for use in glue joints and fillets on naturally finished wood interiors. Mixes easily with epoxy, creates smooth fillets that require little sanding. Brown in color. A blended microballoon-based filler used to make fairing putties that are easy to sand or carve. Dark red/brown in color. A thickening additive used to control the viscosity of the epoxy and prevent runoff from joints. A very strong filler that creates a smooth mixture ideal for general bonding and fillet needs. 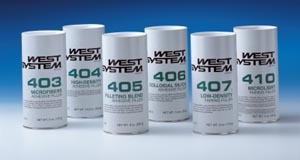 It is West's most versatile filler, and can be combined with other fillers to add strength, abrasion resistance, and consistency, resulting in a tougher, smoother surface. Off white in color. The ideal low-density filler for creating a light, easily worked fairing compound, especially for large areas. 410 mixes easier than 407 or most microballoons and is much easier to sand. It feathers to a fine edge. Not recommended for use under dark paint or surfaces subject to high temperatures. Tan in color. A coating additive used to increase epoxy's hardness and abrasion resistance, and provide limited UV protection. A coating additive used to increase epoxy's moisture resistance and help prevent blistering. 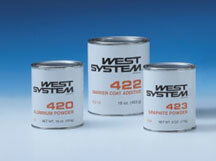 A coating additive used as a low-friction exterior coating. It increases scuff resistance and is commonly used as a bearing surface.